QuiBids is providing another opportunity for FREE bids! 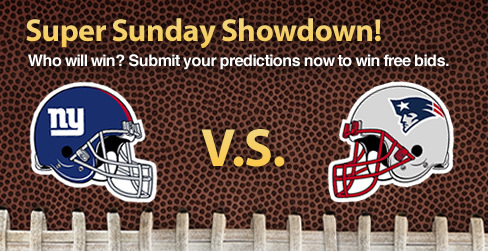 We’ve posted a question on our Facebook page asking “Who will win Super Bowl XLVI?” If our Facebook community makes the right pick (the team with the most votes ends up winning the Super Bowl), we will post a QuiBids Promo Code on Monday morning that can be redeemed for free bids! This game will feature two of the NFL’s top coaches, Bill Belichick and Tom Coughlin, both with Super Bowl rings. This year’s Super Bowl will also feature two elite NFL Quarterbacks, Eli Manning and Tom Brady. Again, both Quarterbacks have Super Bowl rings. Check out how football can change the life of a sponsored child here.